The 7th Annual AIPCO Business Tourism Conference took place at Lough Eske Castle, Donegal from Thursday 21 – Friday 22 March 2019. 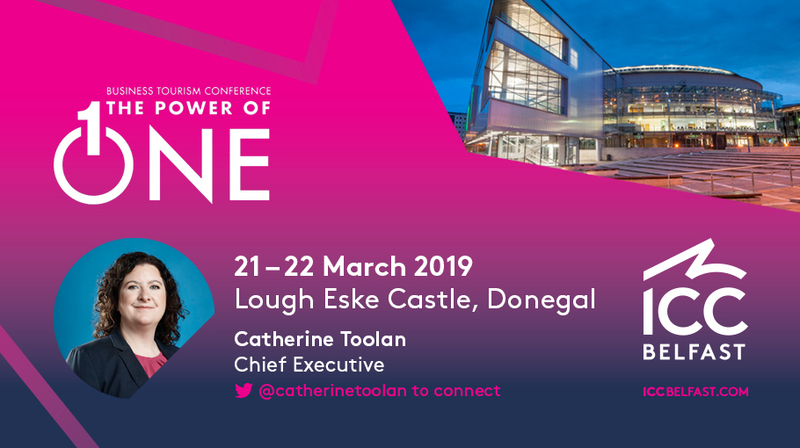 The annual conference, which is a must-attend for anyone involved in Business Tourism in Ireland, is powered by the Association of Irish Professional Conference Organisers, in collaboration with SITE Ireland and supported by Fáilte Ireland. ICC Belfast was proudly represented by Oonagh O'Reilly, Director of Sales and Marketing and Chief Executive Catherine Toolan who was invited to deliver a speaker slot entitled 'ICC Belfast – Delivering for Belfast and Northern Ireland socially, culturally and economically.' If you missed it, or just want to recap, keep reading for an overview of the session. Prior to joining the team in Belfast, I spent over a decade as Managing Director of Global Sports and Events with Aramark, a $15B US Corporation, where I honed my skills and leadership, dealing with people and cultures across three continents, and leading the largest peacetime catering projects in the world, with a team of over 7,000 people. I oversaw the build, design and execution of food and retail in the Athletes Village for the last three Summer Olympic Games - Beijing, London and Rio. Working closely with governments and cities I was able to see the benefits of a Shared Vision to deliver an Olympic Games on a world stage. Despite the challenges these mega events bring, they help forge and create a city identity that lives on for generations and touches the world. They also leave a legacy of scalability, growth and employability for the people of these cities. I have been in this role for over two years now – and many people have asked me what attracted me to Belfast when the opportunity arose to join the what was then the Belfast Waterfront team. I am proud to call Belfast my second home. The people there remind me of the resilience of other countries who have used large events and tourism to build an industry and leave a lasting legacy. Personally, I want to play a small part in this legacy. Belfast today is full of ambition, optimism and above all energy. My family and the families of my team are the people we for whom we want to build a better Belfast for, they're the network we rely on to keep us going. We owe it to these people to deliver a better Belfast, the one that they believe in, and I believe I can leverage my Olympic and International experience and coupled with the passionate people that make up Team Belfast we can make a difference and leave a legacy that is the development of sustainable business tourism for our future and the future of the next generation. We are ready to tell our story to the world. We are growing an exciting industry for the young people of Belfast and Northern Ireland where they can harness a successful career leading, shaping and creating some of the most exciting events in the world. ICC Belfast and our partners aim to make Belfast and Northern Ireland a world leading Business Tourism destination. In partnership with Tourism NI, Belfast City Council and Visit Belfast our goal is to deliver a citywide event experience like no other in one of Europe’s most accessible, vibrant and flourishing cities. We’re confident that from the moment delegates land in our airports until the moment they leave, they know that the whole city is behind their event. Time and time when we debate what our differentiator is, it always comes back to our people, to Team Belfast and our joined-up approach with key city stakeholders and partners. We’ve been able to use this differentiator to define our purpose, our reason for getting up in the morning. Our internal war cry. Belfast is a city transformed. Our part is to win and deliver world class conferences and events so that it becomes a business tourism hotspot. If we do this everyone in Belfast and Northern Ireland can benefit socially, culturally and economically from welcoming new visitors to our city. Today, tomorrow and beyond. Succinctly summed up as: When we win. Everyone wins. An example of our value proposition in practice is the Lookers PLC event, which we held just last month. Having previously held their annual car dealership conference in key UK cities such as Edinburgh and Manchester, a suggestion was made by their local office, Charles Hurst, that they bring it to Belfast. Team Belfast came together to pitch an unforgettable event experience to the Lookers team that surpassed everyone’s expectations. The Lookers message was amplified with branding in our airports, at our venue and throughout the city on our outdoor advertising AdShel network. For those few days, Lookers truly owned the city of Belfast and in the words of CEO Andy Bruce had, their “best ever conference!”. There has never been a better time for business tourism in Belfast and I am truly excited about everything that's to come for both ICC Belfast and for our partners throughout the city.